Practical and easy to understand guides to help you run and grow your business. 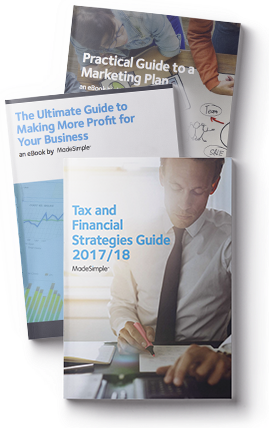 Written by expert accountants, this e-book gives you a whole range of tax tips and planning advice including both business and personal tax - ideal for UK business owners. Discover how to run your business profitably and create a profit improvement plan. Over 20 pages of easy to understand advice and practical tips you can put into action straightaway. The more you understand your market and its needs, the better armed you will be to practice successful marketing. This bundle is made up of 3 resources to help you get your marketing activity off to the best start, including 'The Practical Guide to a Marketing Plan', 'Marketing Activity Matrix' & 'Buyer Personas and Persona Mapping'. How will I get the guides? All the guides are provided electronically, as a PDF for your convenience. There will be a link in the purchase confirmation email for you to download each one. If you can’t find the email, please contact us. The guides are researched and written by our experienced content marketing team, with some sections provided by our carefully selected partners including TaxAssist Accountants. Yes! We also offer a number of free guides and resources which can be found here.